Warriors owners Joe Lacob and Peter Guber talk at the Dub Nation celebration in Oakland. OAKLAND, Calif. (KGO) -- The Golden State Warriors' championship parade will is taking place through downtown Oakland. It is following the same route as the team's last parade that took place in 2015. ABC7 has been proud to be your NBA Finals station, and count on us to continue bringing you the best coverage of the parade and rally. We'll have crews stationed all along the route and will bring you live coverage online and on TV starting at 10 a.m. Click here for the latest stories, videos, and photos on the Warriors. The parade will start at 10 a.m. on Broadway and 11th Street. It will go north on Broadway, turn right on Grand Avenue, then right on Harrison Street, turn left on 19th Street, continue on Lakeside Drive and end on Oak Street with a procession to the Henry J. Kaiser Convention center. Fans are encouraged to line up for the parade and rally as soon as 5 a.m. Thursday. 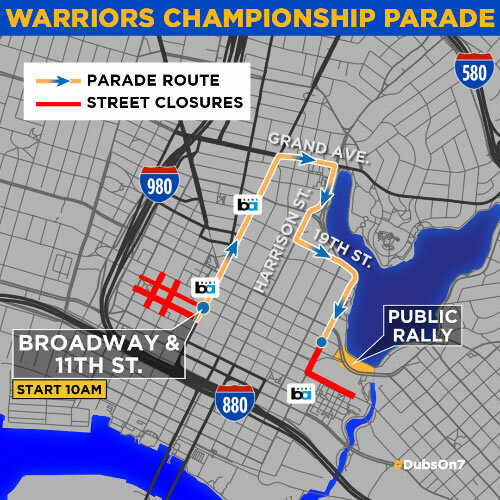 AC Transit lines will be affected by numerous street closures during the parade. Click here for AC Transit's service plans and planned detours. BART officials also issued 10 tips for Warriors fans visiting the parade, including using the 19th Street station and avoiding the much smaller Lake Merritt station, buying a Clipper card to avoid long lines at ticket machines, and avoiding the busiest hours of 8 to 10 a.m. BART trains carried 548,076 riders during the 2015 victory parade, second only to the 586,061 who rode BART during the San Francisco Giants' 2012 World Series parade. More information about Thursday's plans and how to get around on BART can be found here.